We are located in central Idaho, operating from Challis. 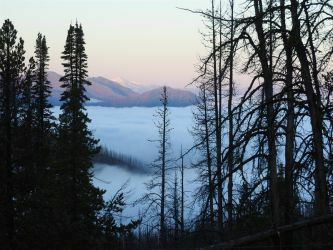 Conducting spring bear hunting, summer pack trips and fall elk, mule deer and black bear hunts in over 150 square miles of the Frank Church River of No Return Wilderness. 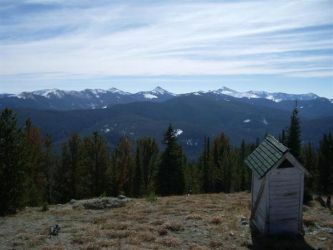 The terrain in the “Frank” is Very rugged and not for the faint of heart; all operations are conducted from wall tents. 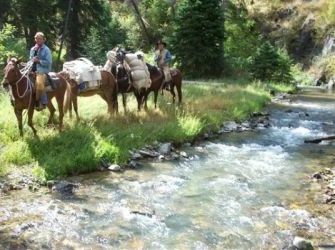 There is great cutthroat trout fishing, hunting bull elk in the rut with rifles, liberal mule deer season, good black bear and mountain lion, plus bighorn sheep and mountain goat. Now accepting reservations for the 2019 & 2020 Idaho Elk, Mule Deer, Black Bear & Wolf hunting seasons. Let's get your Idaho hunting adventure started. Give us a call and make your reservation! Idaho is one of the few western states left that allow rifle elk hunting during the rut and over the counter tags and although there is a quota on Idaho nonresident elk tags, as licensed outfitters in a quota area we have guaranteed tags for hunters who book an Idaho elk hunt with us. 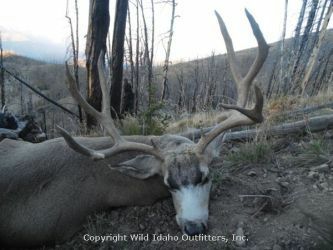 We offer fully guided elk hunts as well as drop camps for the "Do It Yourself" hunter otherwise known as the DIY hunter. 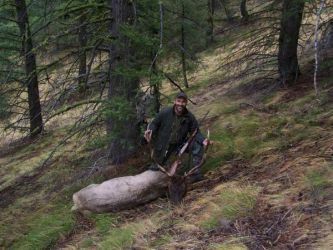 Because of the ruggedness of our elk country, public hunting competition is very rare indeed. 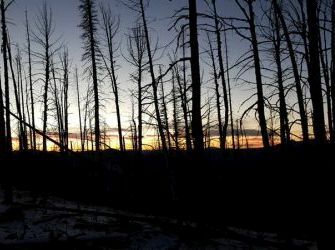 Our Idaho elk hunting area has experienced fires in the recent and distant past that makes for some pretty amazing elk habitat and hunting generally consists of getting to a vantage point and glassing or bugling up a rutting bull elk during our early season Idaho elk hunts. 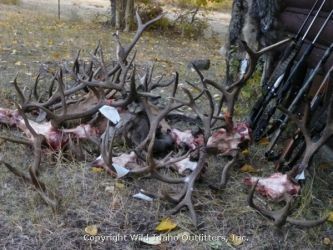 Area 27 mule deer hunting is quite possibly some of the best backcountry over the counter mule deer hunting left out west. 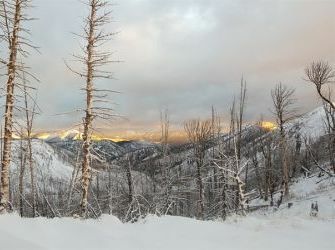 With the vastness and tough access of the rugged Frank Church River of No Return Wilderness area, it allows for a lengthy mule deer hunting season that runs from mid-September to the end of October and actually can run into mid-November with a draw tag that is guaranteed if you apply during the application period that generally takes place in May. 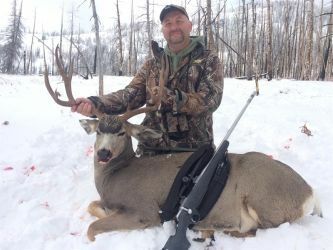 With dates that coincide with the general elk hunting season, it is possible to hunt both elk and deer in a combo hunt that really gets you more bang for your hunting dollar. The rugged country of the “Frank” keeps public hunter competition to a minimum. 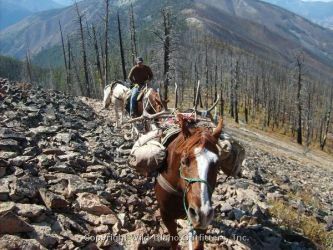 Because of the access or shall we say inaccessibility of Idaho’s backcountry units, Idaho allows for a many different means of take including hunting with dogs and baiting. 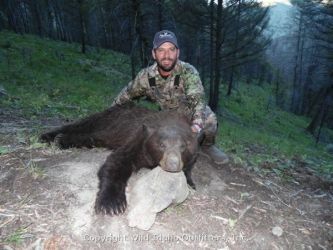 Idaho also allows for a limit of 2 bears in these backcountry areas. Baiting for bears is a very effective way for a selective harvest both on color and gender. With bears visiting the baits it allows the hunter time to assess the size and color phase of the bears and to avoid the bears with cubs. 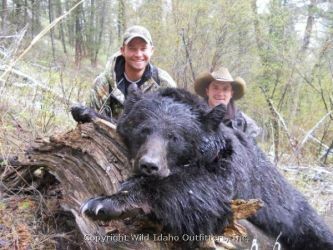 Idaho has a high percentage of color phase bears and the possibility of seeing a very nice cinnamon, chocolate or blonde color phase black bear is very real. Idaho is the last state that we are aware of where you can still pursue multiple game species during the same time frame. 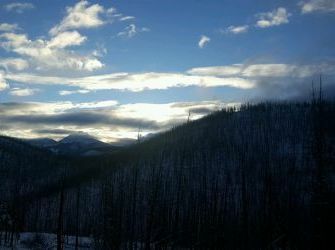 In the backcountry zones like our Middlefork zone all the seasons overlap and allow for elk, deer, bear, wolf and mountain lion hunting all at the same time. 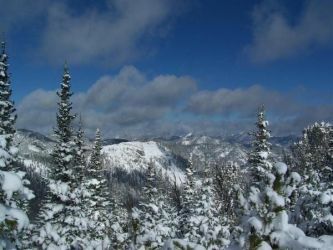 Throw in a little grouse hunting and maybe some backcountry fishing and you can see how Idaho can be an outdoorsman’s paradise! Join us for a combo hunt and enjoy all that Idaho has to offer. 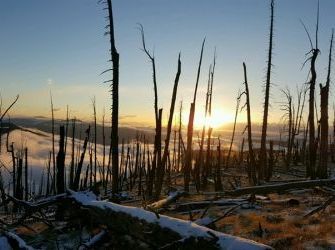 It's quite possible you will also be able to experience all of Idaho's seasons, spring, summer, fall and winter, all within the span of a one week hunt. 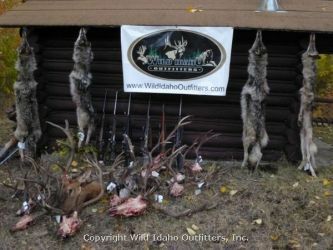 We are offering wolf hunts in Idaho’s Middlefork zone which currently has no quota. We are combining wolf hunts with the opportunity to possibly even harvest a mountain lion along with the possibility of a coyote; making for what might be considered the ultimate predator hunt. 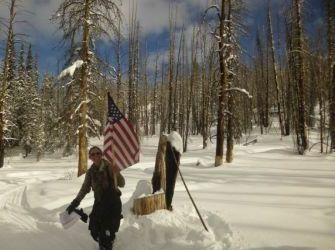 Remember these are mid-winter backcountry hunts and are very physically demanding. During the fall you can add that to your combo hunt and make that 4 species you are after during the same time frame and really stretching that hunting dollar. The State of Idaho encourages youth hunting for both residents and non-residents. The Idaho Fish and Game has a junior mentor program with greatly reduced license and tag fees. 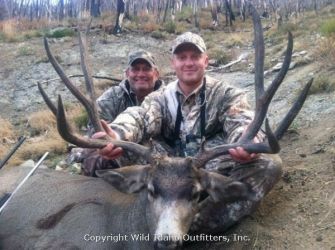 We at Wild Idaho Outfitters also encourage families with young hunters and offer reduced pricing on our hunts for juniors’ ages 10 to 17 when accompanied by a paying adult. This is a great opportunity to encourage young hunters and get them started with a good hunting experience. So, what are you waiting for? Join us with your youth hunter(s) and make some lasting memories. 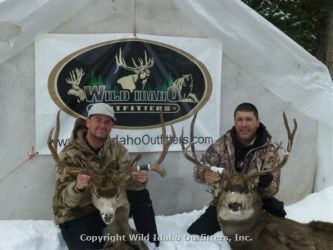 Let's get your Idaho hunting adventure started! Give us a Call and make your reservation. 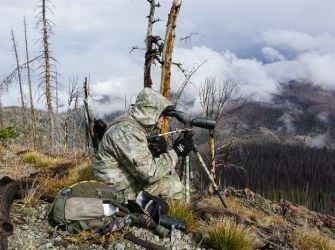 Backcountry hunting is tough and you need a guide as tough as the country they will be guiding in. We believe here at Wild Idaho Outfitters, that we hire some of the toughest guides in the business. 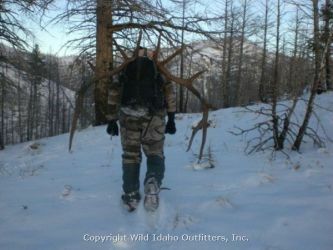 They will go the “extra mile” to get you the best possible opportunity on your Idaho hunt. Our guides are seasoned hunters and outdoorsman…even the young ones are raised in the backcountry, on a farm or on the back of a horse and all take your success very personally. If an Idaho outdoor adventure is on your “to do” list please give us a call or shoot us an email and let’s get started on your Idaho outdoor adventure! We look forward to sharing our past adventures and creating memorable experiences with you. Check out the information we have available for you but don’t forget to check back often as our content and information will be updated regularly. Please feel free to look around and provide us comments and feedback by using the "Contact Us" menu choice. 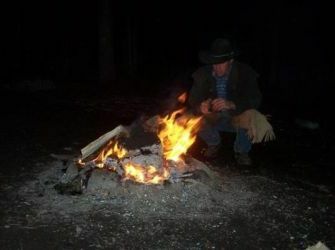 Come stay with us and experience first hand the amazing beauty of a glowing camp in the wilderness.